This card sits in the front of Grammy's recipe box. It was obviously an important reference. Written in fountain pen by someone other than my Grammy, I'm guessing it dates back to the 1910-30's. 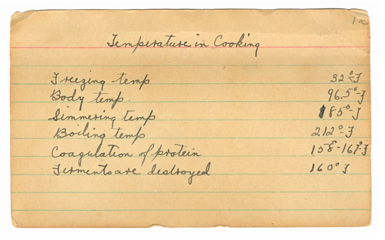 It's a simple reference--one that was probably very important in the kitchen of my great grandmother and my Grammy. Both Grammy and her mother lived at near sea-level. I know that when my Grammy moved to a higher elevation (in the early 1940's) she probably had to adjust her temperature references. Well, coagulation of protein is important in bread baking- you want to make sure your bread gets past the temperature where its protein coagulates. Otherwise, your bread won't "set". That also happens to be the temperature (ish) where just about any foodbourne illness will be killed, though I don't know how much they knew about that back in the 30s. As for "ferments" being destroyed, I don't know what she means by that. Yeast dies at about 140F, so that's on the high end if she's meaning yeast by "ferments".